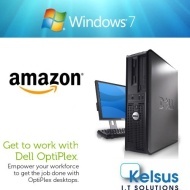 alaTest has collected and analyzed 18 reviews of Dell Optiplex PC Dual Core 6GHz Processor 4GB Memory 1TB 1000GB H/D WIFI Windows 7 Computer Ready To Surf The internet and a Free 17" TFT. The average rating for this product is 4.4/5, compared to an average rating of 4.2/5 for other Desktops for all reviews. Reviewers are impressed by the price, whereas many are negative about the reliability. We analyzed user and expert ratings, product age and more factors. Compared to other Desktops the Dell Optiplex PC Dual Core 6GHz Processor 4GB Memory 1TB 1000GB H/D WIFI Windows 7 Computer Ready To Surf The internet and a Free 17" TFT is awarded an overall alaScore™ of 88/100 = Very good quality. alaTest has collected and analyzed 18 user reviews of Dell Optiplex PC Dual Core 6GHz Processor 4GB Memory 1TB 1000GB H/D WIFI Windows 7 Computer Ready To Surf The internet and a Free 17" TFT from Amazon.co.uk. The average user rating for this product is 4.4/5, compared to an average user rating of 4.2/5 for other Desktops on Amazon.co.uk. People really like the price. Many are critical about the reliability.